Every month I like to do a monthly goal review. I find that it helps keep me moving forward on the road toward accomplishing my goals. It also allows me the ability to see what’s working and what’s not working so I can either pat myself on the back or make a new plan. 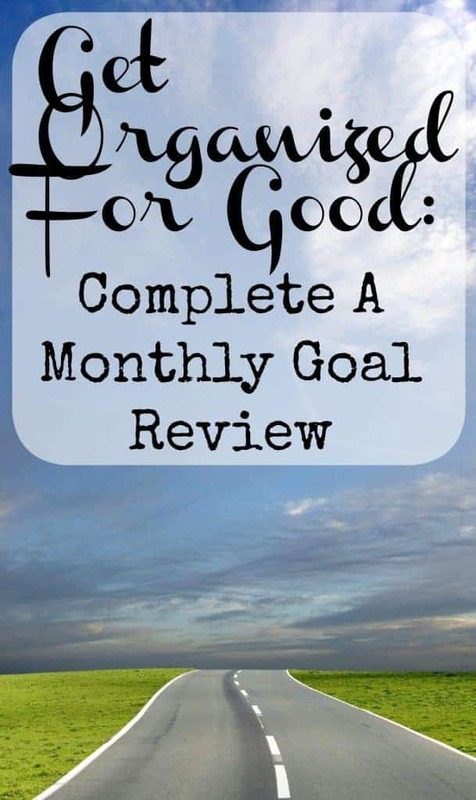 For me, completing a monthly goal review is similar to completing a yearly goal review with one main difference. For the yearly goal review I focus on reviewing prior goals and then brainstorming to create new ones. See my post The Year Ahead: Making Resolutions & Setting Goals for more information on completing a yearly goal review. Once finished I have a master goal list that I can work with for the rest of the year. I then select three goals I would like to work on for the year. Next, create an action plan to prepare for success in the new year. Pop over to have a look at How To Create An Action Plan To Accomplish Goals for more information. Review & assess progress towards your yearly goals. Did you make progress toward your goals? Did you make a plan to accomplish it? How did your plan fare? What if anything can you do to improve your progress? Review & assess prior months goals. Did you reach your monthly goals? Why or why not? Use this information to plan for success this month. For each yearly goal, write down 3-5 monthly goals to complete for the month. Write these goals down in the appropriate place in your planner. Make sure that these monthly goals are attainable within the coming month. Break down monthly goals into the smallest action steps possible. Each step should have only one action associated with it. Head over to read How To Create An Action Plan To Accomplish Goals. Create a weekly plan of action–next steps–toward accomplishing each monthly goal you have set. Create the space to take these steps during your day. Do this by making a space within your daily rhythm to complete them. See Establishing A Daily Rhythm. Write these action steps down to complete within the appropriate part of your daily rhythm. If you are at all curious, my other goals for this year were also posted to set up accountability for myself–a scary but effective and necessary component of goal setting. Those goals were New Year Resolution Goal #2: Get Outside & Connect, and New Year Resolution Goal #3: Build & Grow my blog — the latter article contains great tips for setting goals that support and balance each other if that interests you. I only complete this step if I feel that I am making progress toward my other three goals and feel I can successfully add in another, or if I feel I need to establish a habit to assist me in better meeting the goals I have already committed to. If I feel that I am not making progress toward my goals or feel imbalanced in any way I look for what will support my efforts and choose accordingly. It’s best if the habit you choose is something you do daily. Daily habits are easiest to implement because when a habit is done daily, it easily become automatic over time — you will no longer even need to think about it once it becomes established. Here are some ideas of habits you might choose: saying a morning prayer or affirmation, flossing, a daily walk, spending time outside, bringing your email inbox to zero, meditating, writing in a journal, etc. As I see it… goal setting, habit creation, and rhythm all go hand in hand. Some habits are goals, some goals need good habits to accomplish, and following a daily rhythm is one long daily habit. If writing down your goals is the true elixir of success it’s touted to be, then creating positive habits is the key to living the life you’ve always dreamed of. Because these elements support and assist each other, I use them to help me reach my highest potential. Slowly. Goal by goal — one habit at a time.